I ride year round. Every day, whether it's raining or snowing I'm out there. When the weather gets really bad, you need to dress correctly for the conditions. You also need to make sure your bike is ready. I'm not a fan of the winter beater bike concept. I like riding a good well maintained bike all year. So instead I just make sure my bike is up to the task of winter. Either grease and oil the bike for the oncoming salt storm or get a bike shop to do it. The next big thing is tires.. 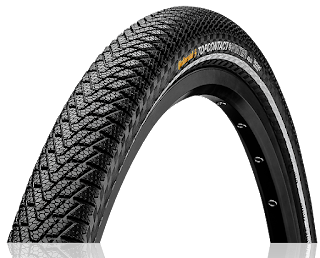 Chances are your regular tires are not up to the task unless you are riding a mountain bike, and even then, I recommend winter specific tires. I personally use the Continental Top Contact Winter tire. There is now a version II sold by MEC. This is a winter compound tire without spikes. For most people this is sufficient for winter riding in the city. If you really want to be safe, you can get the Schwalbe Winter tire from MEC. You will gain the piece of mind of protection against slips on ice, but at a cost of lower rolling resistance and weight. If you plan to only ride during clear snow free days, you can get away without using winter specific tires. The city does a good job of clearing and salting the roads. This is probably one of the most important parts on this list. Nobody wants to be covered in road sludge. MEC carries an excellent line of inexpensive yet durable fenders from Planet Bike. I personally use the Cascadia Hybrid Fenders. You need to be as visible as possible in the winter conditions. It's dark out there, and if it's snowing, visibility is poor. The crappy blinking lights you probably have are useless in these conditions. You need a set of high quality bright lights on solid (not blinking) mode. I'm personally a fan of the Lezyne lights. I find them great build quality, good battery tech and bright. I have something similar to the Hecto Drive Pair. As you can see from the picture above, when it gets really cold, I leave no skin exposed. I need glasses to see, so goggles with prescription lenses are a must. If you don't need glasses, then I actually recommend just using a balaclava and leaving your eyes uncovered to prevent fogging up. 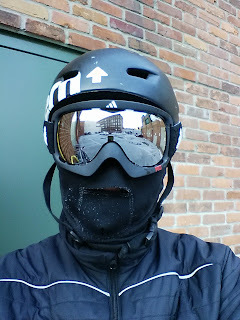 I also use a Bern "Snowbording" helmet instead of a bike helmet. They are the same as their bicycle helmets except for the liner and the clip for the goggle strap. You don't need to go that far unless like me, you need glasses and don't want to wear contacts (and maybe already ski and have goggles already). The new version of the balaclava I use, which has a flip back feature so can be used just as a neck warmer easily. There are several problems you're trying to solve when cycling in cold and wet weather. Unfortunately, an article of clothing that has all of the above costs money. Compromising on the first two points means you'll be miserable. Compromising on the last means you could not make it to your destination as riding in the winter means poor visibility for all. You can get insulated winter tights, and for longer commutes of greater than 10kms, that's what you might want to get. But my commute is short enough that I like having shells over my regular pants. You'll also want a warm layer. You probably have something already, but any Marino Wool base layer is great for this application. Ice Breaker has a line of high quality stuff, but MEC has it's own less expensive line as well. If you want to spend a less money, and have slightly bulkier clothing, MECs line of cycling specific gear is good value. Now this is the easy one, just wear whatever you want that keeps your feet warm and dry. There is nothing special here. Unless you want to ride clipless pedals. I highly recommend ordering the Shimano XM9 Gore-Tex shoes. Though they are available in North America now, they are far cheaper from Chain Reaction in the UK. I have the previous generation of these and they are great. Shimano has very consistent sizing, so if you can figure out what Shimano shoes fit you, it's safe to order them online here. I've left the worst for last. So maybe I'm crazy, but I find that I need a different pair of gloves for every 10 degree temperature difference outside. Having hands that are too cold is horrible, especially for longer rides. Having gloves that are too hot is worse, as first you sweat, and then the damp makes it even colder. Gloves are also highly subjective due to fit and your natural body temperature. Here are my recommendations for different temperature ranges. You'll notice the last option isn't a glove at all. It's actually a giant mit for your bike you slide your hands into. For your hands, then you only need a thin liner. Only for the truly crazy I guess. There are people who are going to read this and scoff. I've spent too much money and it's unnecessary. I've been riding year round for years now and I'm willing to spend the money to be comfortable and dry. This is what I've found I needed to do. Your mileage, of course may vary.